When it comes to picking your China set, you want to be very careful and sure about your decision. It’s an expensive investment, and chances are it will be with you for many years to come. You want a set that works for your most meaningful occasions and will fit for the special events you plan on using them for. Red Vanilla’s Extreme Bone China 16-Piece Dinnerware Set holds all of the necessities that make for a standard China set and has a very pleasing straight edge appearance. The angles of this set seem to be fit for the modern household looking for a nice luxury set of China to store for décor and use on occasion. The ultra-white finish is also a great selling point. It will give any table a clean and crisp look, especially if your table has a dark finish. Your food is the focal point, and this China set ensures that. The set includes four dinner plates, four salad plates, four bowls and four mugs. For everyday use and abuse, it’s hard to beat the classic look of white dinnerware, and reviewers say it’s hard to beat the price of the AmazonBasics Dinnerware Set. Available only in white, the 16-piece set includes four place settings each with a 10 1/2-inch dinner plate, 7 1/2-inch dessert plate, 5 1/2-inch bowl and a 10-ounce mug. AmazonBasics dinnerware is made of microwave-safe porcelain. It can safely go in the oven, freezer, and dishwasher as well. Owners love the classic round shape and say the pieces are weightier than they expected for the low price. Most are happy with durability, saying they resist chipping and scratching admirably. However, some reviewers say they received plates that were slightly warped, making them hard to stack perfectly. Others say the white finish actually has a gray tinge that they dislike. Buyers willing to invest in something more formal without resorting to bone china may be tempted by the Lenox French Perle dinnerware, which is embellished with scalloped edges, embroidery-inspired raised beads, and hand-stained rims. Available in white, pistachio, violet, and ice blue, each four-piece setting includes a nearly 11-inch dinner plate, 9-inch accent salad plate, 6 1/2-inch bowl and 12-ounce mug. Sets come with round plates, but square plates are available separately. Despite its traditional look, Lenox French Perle dinnerware is made of dishwasher- and microwave-safe stoneware. It’s also backed by a lifetime breakage replacement program, which lets buyers replace broken dishes for half their retail price. Owners love the look of this set, saying it’s beautiful but not too delicate or stuffy for everyday use. Though a few reviewers complain of scratches from flatware, most say these dishes are sturdy, weighty, and hold up quite well against chips and cracks. Gibson’s Melamine Brist 12-Piece Dinnerware Set makes for a brilliant outdoor display when throwing a small gathering. This is a small set, for four people, but if you plan on using paper plates as primary settings, these make a great display to lay your courses out in. The pastel blue, orange, pink and green coloring are fun and bright for any occasion. You can virtually pair these with any flatware to spice up your outdoor space. Plus, they’re a great set for you and your family to enjoy when taking in fresh spring and summer air. Reviewers say the Gibson Soho Lounge Square Reactive Glaze dinnerware is inexpensive and practical for everyday dining, but it also has a casual elegance that elicits compliments from dinner guests. The 16-piece set is available in at least eight colors, including blue, red, and taupe. It comes with four place settings: Each has a 12 3/4-inch dinner plate, 9-inch dessert plate, 6 1/4-inch bowl and a 12-ounce mug. 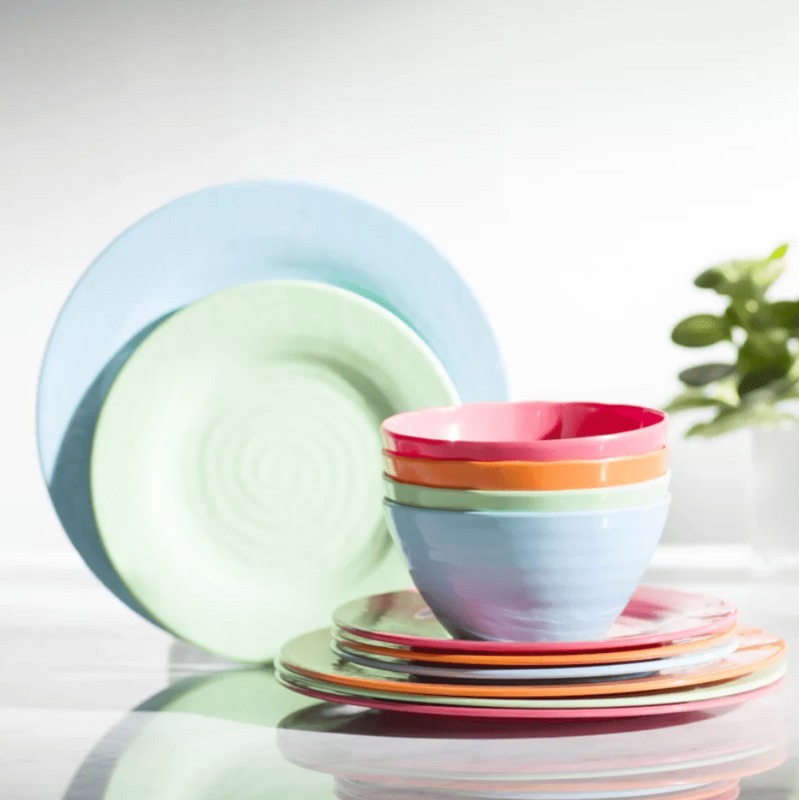 Made of dishwasher- and microwave-safe stoneware, Gibson Soho Lounge dinnerware has a two-tone finish and a reactive glaze that give each piece a unique look—a refreshing change from the uniformity more typical in mass-produced sets, reviewers say. They also like that the pieces have a nice weight and heft that makes them feel more expensive. As with all stoneware, chipping and cracking can be an issue, however. And because each piece is slightly different, the plates and bowls don’t stack quite as tightly or cleanly as some reviewers wish. Fiestaware has enduring popularity, and it’s easy to see why. The pieces are vibrant, durable and extremely easy to care for. Though a bit pricier than some other brands, owners say you simply get what you pay for here. Each four-piece setting includes a 10 1/2-inch dinner plate, 7-inch salad plate, 19-ounce bowl and 10-ounce mug. It’s also available in more than a dozen saturated colors, including tangerine, turquoise, and poppy red. It’s hard to beat ease of use with Fiestaware, made of dishwasher-safe, microwave-safe, freezer-safe and oven-safe glazed ceramic. Reviewers say they’ve had Fiestaware for years and find it impressively resistant to chips and cracks. Because the company keeps the pattern consistent and offers dozens of coordinating pieces, it’s easy to add to your collection for years after your original purchase. Though most owners love these dishes, a few say the mugs are far too small, and some buyers say colors can be inconsistent. 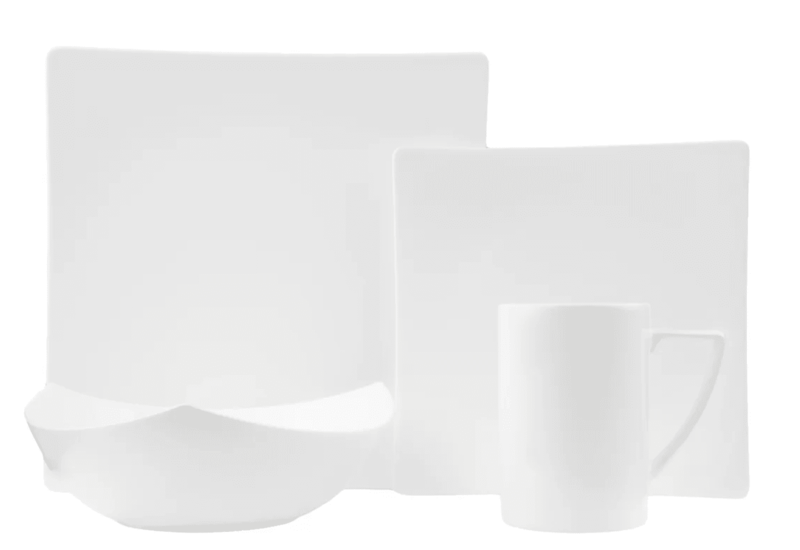 There’s no need to be ultra-careful with the Corelle Square Dinnerware Set, owners rave. Made from a patented break- and scratch-resistant glass called Vitrelle, this 16-piece stands up to a lot of abuse. It includes four place settings, each with a 10 1/4-inch dinner plate, 8 3/4-inch lunch plate, a 22-ounce soup/cereal bowl, and a 12-ounce mug. Vitrelle resists cracks and chips, but it’s also dishwasher-safe, microwave-safe and oven-save up to 350 degrees Fahrenheit. Reviewers who want to save space in cabinets like how tightly the plates stack. They also like how lightweight each piece is, making these dishes more manageable for kids or even arthritic hands. The square design earns raves for being a little more modern than typical plates, and a number of patterns are available for buyers who want something beyond basic white. A few reviewers say the patterns sometimes look cheaply printed, however. So if you’re concerned about looks, opt for classic white. We bought and tested three top-rated dinnerware sets. Our reviewers spent six hours setting their tables, eating with them, and cleaning each of the pieces. We asked our testers to consider the most important features when using these dinnerware sets, from the number of place settings to the sizes and shapes of the individual pieces. We’ve outlined the key takeaways here so that you, too, know what to look for when shopping. Number of place settings Are you looking for just enough plates for your small family, or do you want enough to set the table for the entire extended family for the holidays? How often do you invite friends over for dinner? While it might not make sense to store more dishes than you need, it’s handy to have a few extra place settings so you don’t have to use paper plates when you invite the neighbors for a friendly meal. Pieces per place setting Most place settings include four pieces, but you can find some with fewer—and sometimes more. A three-piece setting is likely to omit the coffee mugs, so you’ll need to decide whether matching mugs are important, or whether you prefer your favorite novelty mugs instead. More pieces aren’t a bonus if you won’t use them. Bowl shape and size Most place settings include some type of bowl, but while dish sizes are fairly consistent, the bowl shapes and sizes are quite different. While you might not serve soup with every meal, bowls can come in handy for cereal, salads, ice cream, and even as serving pieces for side dishes. Which shapes seem most useful to you? “If you are looking for a basic, inexpensive, uncomplicated set, this will get exactly the job done,” one of our testers said of this 16-piece option. Our reviewers particularly liked the “pleasant, neutral design” and the fact that the dishes seem “sturdy enough to put up with moderate everyday use.” In terms of negatives, one of our reviewers said, “The finish left a lot to be desired—there were pits and pinpricks in the glaze that were evidence of a sped-through production and QC process.” Plus, one of our testers wished the mugs and bowls were bigger. Overall? “Particularly at this low price, the set is worth buying,” declared one of our reviewers.